The Vitality London 10,000 starts and finishes in St Jamess Park and uses Green Park as its assembly area. The race starts on The Mall and finishes on Spur Road opposite Buckingham Palace. Runners follow a clockwise route around the City of Westminster and the City of London. The course passes many of Londons famous sights including Admiralty Arch, Nelsons Column, St Pauls Cathedral, Mansion House, the Bank of England, the Old Bailey, Somerset House, Big Ben, the Houses of Parliament and Westminster Abbey. Each kilometre will be clearly marked. A timing mat at the halfway point will take your 5km split time. There are water stations at 3km and 6.5km. Toilets will be placed close to 3km, 5km and 7km for runners use. Entrants must be at least 15 years old on the day of the event. A copy of the Vitality London 10,000 Final Instructions is emailed to all participants and will be available to download on this page in the build-up to Race Day. Each kilometre will be clearly marked. A timing mat at the halfway point will take your 5 km split time. There are water stations at 3km and 6.5km. Toilets will be placed close to 3km, 5km and 7km for runners’ use. The race will start in waves. Runners start on The Mall, by kind permission of The Royal Parks, and finish in front of Buckingham Palace. Our marshals will direct you to the start zones according to your running number. Line up in the start zone that matches your letter and colour at the appropriate time. Remember that your timing device on your shoe will give you an accurate time regardless of which wave you are in. The race Finish Line is on Spur Road, in front of Buckingham Palace. Once across the line you will be directed to low ramps where your IPICO Sports Tag will be removed from your shoe. You will then receive a goody bag containing your medal and sized finisher T-shirt before being directed back to the Green Park assembly area to retrieve your belongings. Outside the secure area, but still within Green Park, is the meet and greet area and this is the recommended place to meet friends and relatives. A-Z signs demarcate the area so remember to agree a letter in advance where you intend to meet. There will be a secure runners-only area in the assembly area of Green Park where you will be able to leave your belongings. These should be put inside your kitbag with the baggage label (showing your running number) attached. Pull the drawstring and tie it to prevent items falling out. Find the marquee with the number range that includes your running number and hand in your bag to one of the volunteers. We will only accept the kitbag with the label attached; other bags won’t be accepted. You will not be able to retrieve your belongings until after the race, so make sure you have everything you need with you before handing in your bag. If the weather is cool we suggest you wear old clothing or a bin liner to stay warm before the race starts. The assembly area will have toilet facilities and Buxton Natural Mineral Water available to runners. Our team at the information point will be able to help with any questions and there is also a First Aid point. Listen to the PA, which will give important information on when you should assemble for the start. Our marshals in this area will also be on hand to assist you. The assembly area is in Green Park. The nearest Tube stations are Green Park and Hyde Park Corner. Piccadilly Circus, St James’s Park, Charing Cross and Victoria are also within walking distance of the assembly area. Marshals will be at the exits from stations and on the routes to the assembly area. We do not recommend driving; many roads will be closed from 08:00 due to the event, and parking in the area will be difficult. Pin your number to the front of your T-shirt or running vest using the safety pins provided in your pack. Your running number has a coloured background with a zone letter. This indicates your zone at the start. Spare pins will be available at the information point in Green Park on the day. You must not use someone else’s number, nor let someone else use yours. Imagine the anxiety caused to either set of relatives and friends in the event of misidentification should there be a medical emergency. Your tag is enclosed with your Final Instructions magazine. It must be fixed to your running shoes using the provided wire twist ties. If you need additional instructions, or wire twist ties to fix the IPICO Sports Tag, these can be collected from our information point in Green Park on Race Day. The tag contains a passive transponder and this will be used to provide your finishing time. If you do not wear your tag then the system will not record you finishing and therefore we will not be able to provide you with a finishing time. Official results will be based on the elapsed time taken by each runner between crossing the mats at the Start Line and the Finish Line. When you cross the Finish Line, we have teams of helpers to remove the tag from your shoe – you do not need to do anything apart from follow the marshals’ instructions. Please do not fix the tag through your shoelaces; if you do we will have to cut your laces to get the tag back! 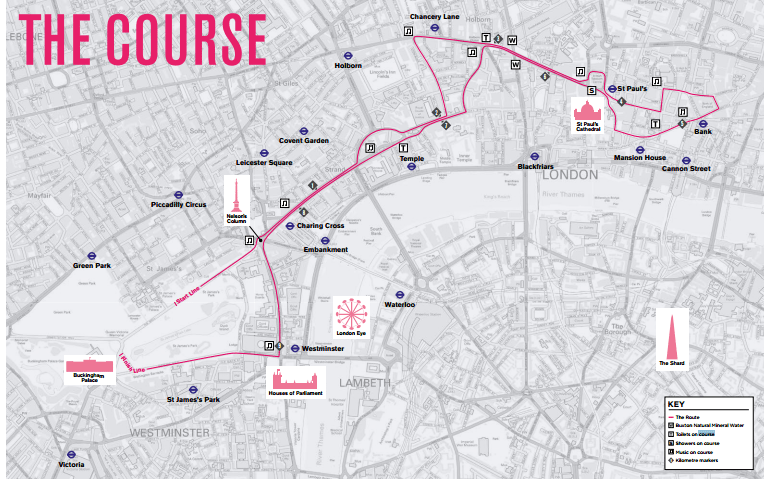 The Vitality London 10,000 course is ideal for spectators. Runners run along the Strand twice, at 1km and then again at 8km, making this a great place to watch the action. The course passes many of London’s famous sights including Admiralty Arch, Nelson’s Column, St Paul’s Cathedral, Mansion House, the Bank of England, the Old Bailey, Somerset House, Big Ben, the Houses of Parliament and Westminster Abbey. As with runners, we do not recommend driving; many roads will be closed from 08:00 due to the event, and parking in the area will be difficult. Full details of road closures related to the 2018 event will be available closer to Race Day. A number of Tube stations offer excellent access to different sections of the course. Visit www.tfl.gov.uk for up-to-date information on engineering works and to plan your journey accordingly. The Meet and Greet area is located within Green Park and is where runners will retrieve any baggage they handed in at the assembly area before the start of the race. This is the recommended place to meet any friends or relatives who ran the Vitality London 10,000. A-Z signs demarcate the area, so remember to agree a letter in advance where you intend to meet. There are three First Aid points on the route – at 3km, 5km and 9km. There is also a full medical team at the finish. Team results and prize money will be based on the results of runners who are eligible to represent Great Britain and who have adhered to British Athletics rules regarding club vests.Individual prize money is only available to runners who are eligible to represent Great Britain in international competition. This position has been agreed by the London Marathon and British Athletics to enhance the development of UK runners. Make sure you have the following: running number and safety pins, IPICO Sports Tag and wire twist ties to fix it to your shoe (better still, attach it to your shoe before you leave home for the race), your kitbag and baggage label with running number printed on, and your Final Instructions magazine! If you lose any of these items before the day they can be replaced – you should come to the information point as soon as you arrive. There is a £10 charge to replace a lost IPICO Sports Tag, which will be payable on the day by cash, cheque or credit card before a new tag is issued. Please remember that it is very foolish to run in the event if you have had any sort of virus or fever in the last four weeks. It is equally foolish to run with an injury – in these circumstances, please DO NOT RUN. If you decide not to run for any reason, you must return your IPICO Sports Tag. Please use the special freepost envelope enclosed with this pack. It is a condition of the event that all tags that are not returned within 21 days of the event are subject to a £10 lost-tag charge. The Royal Parks have warned us that there is a particularly high pollen count from the plane trees in Green Park this year. Please plan ahead if you think this may affect you. We are only able to keep the road closures in place for a limited amount of time. In order for the roads to be cleared ready for reopening, any participants still on the route after 11:30 will be directed onto the pavement to complete the race. Please follow the instructions of marshals. Our Finish Line will still be in place and able to give you an official finish time until 12:30. Searchable results for the Vitality London 10,000 are available on our Race Results page. Q. What time does the race start? A. The start time for the 2018 Vitality London 10,000 will be available in due course. Runners are advised to arrive at least an hour before the race start time in order to get their bearings, find the baggage tents, locate the toilets and find out any last-minute details about the course. Q. When will I receive my race pack? A. Race packs will be sent via Royal Mail post two weeks prior to Race Day. Q. What will be included in my race pack? A. Your race pack will include your running number, IPICO Sports tag, Final Instructions booklet, baggage bag, safety pins and wire twist ties. Q. What happens if I do not receive my pack in the post before Race Day? A. If you have not received your race pack in the post two weeks prior to Race Day please contact the helpdesk, who will be able to issue you with a new pack, on 020 7902 0200. If you are unable to contact the helpdesk more than a week before the race, we will not be able to post a new pack to you. In this instance you will need to collect a race pack on the morning of the race from the Information Tent in Green Park. Q. What time do I need to get to the start area? A. Please aim to arrive no less than 30 minutes before your start time. Q. What are the nearest stations to the start? A. The assembly area for the Vitality London 10,000 is in Green Park. The nearest Tube stations are Green Park and Hyde Park Corner. Piccadilly Circus, St James’s Park, Charing Cross and Victoria are also within walking distance. Q. Where can I park near the start/finish area? A. We do not recommend driving as parking in the area will be difficult. Public transport is the best option, but do check for any possible weekend engineering works before you travel at www.tfl.gov.uk/check. Q. How will I find my start wave? A. Confirmation of your start wave will be included in your race pack, which will be sent out two weeks prior to Race Day. Q. Are there drinks available on the course, and where? A. Buxton Natural Mineral Water will be available to runners at the 3km and 6km marks of the race. Buxton Natural Mineral Water will also be available in the assembly area in Green Park. Q. Are there toilets along the course, and where? A. There are no toilets along the course. However, there will be toilets available to runners in the assembly area in Green Park. Please make use of these before making your way to the Start Line. Q. Where is the finish area? A. The race starts and finishes in St James’s Park. Q. How can I meet up with friends/relatives after the race? A. You will be directed back to the assembly area in Green Park by the finish area marshals. Please arrange to meet your friends and/or relatives at a pre-designated point in this area after the race. There was fun at the start when runners were asked to vote for which song they wanted to go over the start line to - unfortunately it took so long to get everyone moving through the funnel and over the start line, the song had finished by the time I got there. Lucky the next song was a good one! It was a very hot day and there was plenty of water available, including vats of water at the finish so you could refill bottles as much as you liked, which was very much appreciated. Pretty nice goody bag and another medal for the collection. Will probably do this one again. This was the fourth event run by the same organisers of the Big Half, London Marathon and Westminster Mile that I was participating in this year. The race village was exactly the same as the Westminster Mile the day before so I knew where to go. It was extremely busy in comparison as everyone would be setting off together rather than in waves. Bag drop was straight forward although the was a long wait on return to get my bag after the race. Getting to the start area could have been a bit quicker as the queue wasn't moving very fast. Other than those points I love races in London because of the iconic landmarks and the crowds. It was a hot day so it made for testing conditions. As far as I could remember the water stations were well stocked but I usually run with my own nutrition on such occasions. As with previous London Marathon organised events you get a great medal, tshirt and goodie bag. Lovely to run in the city of London and managed a PB so very chuffed. Only criticism, it was a very hot day and there was no water given out pre race, when some racers decided to help themselves, they were told off by a marshal, saying, 'if you take it now, there will be none at the end'. But thoroughly enjoyed running with such large crowds and a real mixture of abilities. great course, great atmosphere, love the bands, great t-shirt, nice medal and goody bag and lots going on at the event village. I do this race every year and love it, it’s also more sensibly priced than many of the closed road races. This is a lovely friendly, entertaining run. The crowd are very supportive and fun to watch. Lots of great bands en route too! Could the weather be a little cooler next year please? The route is 1600m + 3laps. On race completion you will be awarded a medal and t-shirt to show off to all your friends! There will also be trophies for the top three male and female runners! The Virgin Money London Marathon is one of the six World Marathon Majors and the undisputed king of the UK race calendar. Over 400,000 hopefuls went into the ballot for the 2019 event - a new record. The famous route takes athletes past London's historic sites, and crowds that have to be seen to be believed. In 2016 runners raised more that 59 million for charity, breaking the record for an annual single-day charity fundraising event for the 10th year in a row. The event has raised over 1bn for charity since 1981 and completing it is a lifetime ambition for every runner. Developed by the Mayor of London and his agencies in 2013, Prudential RideLondon is a world-class festival of cycling. The fifth edition will take place over the weekend of 28-29 July 2018. There is no other closed-road event like it that combines the fun and accessible element of a free family ride in central London with the excitement of watching the worlds best professional cyclists race in the Prudential RideLondon-Surrey Classic and Prudential RideLondon Classique. Taking a cue from the London Marathon, amateur cyclists also participate in the Prudential RideLondon-Surrey 100 a 100-mile challenge on the same closed roads as the professionals, with the added incentive of raising money for good causes. For the first time in 2016, the event also featured the Prudential RideLondon-Surrey 46 a 46-mile sportive created specifically for newer and also younger cyclists.